Hard Rock limited edition golf shoe bag for all entrants. Hard Rock Hotel Pattaya, together with Pattaya Mail Media Group is holding its very first Golf Tournament Fundraiser 2013 at the Eastern Star Golf Club, Ban Chang on Saturday, 21 December in support of the Hard Rock Pattaya’s ‘Take Times to Be Kind’ projects in 2014. The tournament will be run in true Hard Rock Style! 18 holes, plus some extra holes of challenging fun can be expected. This is for amateur golfers, individual format with system 36 and Stableford, to be divided into 3 flights with handicaps split at 0-12, 13-18 and 19-24. There are some exceptional souvenirs & trophies for winners and runner ups of each category coupled with some technical holes to be won, which includes longest drive, nearest to the pin and a special prize for the highest score. On top of that there will be a 19th Hole with souvenirs to be won - try your putting skill using a real-size guitar instead of a putter, either acoustic or electric, your choice! Forgot to bring the sun lotion, no worries, the Hard Rock pretties will be glad to apply it for you, for a nominal fee of course, all for the sake of charity! On the golf course, cold beer & drinks will be served by more pretties who will also help you tee up your ball on the par three charity hole where you need to hit the green with your first shot or contribute THB 100 in exchange for another cold drink. After a hot day on the course, the Hard Rock ‘hospitality’ hole will provide you with a cold towel and refreshing cold ginger tea plus a complimentary 15 seconds shoulder massage by the Rock Spa masseuse. Just don’t get too comfy or you might forget about your golf game! For any golfer lucky enough to record a ‘Hole-In-One’ on the par-3 17th, a prize with a value of more than THB 100,000 will be awaiting for you. Registration is at 10 a.m. onwards at Eastern Star Golf Course with the shotgun start at 12 noon. One of the tournament rules for the day, to help enhance your focus, is that you need to down a shot of tequila prior to tee-off. The prize giving and party reception with food and free flow of drinks will be held at The Soul Lounge, Hard Rock Hotel Pattaya from 7 p.m. – 10 p.m. The fee to take part is THB 3,000 net per golfer, including green fee, caddy fee, dinner & drinks, golf prizes, Hard Rock limited edition golf shoe bag, lucky draw and more. Golf cart rental is available at THB 600 per cart and can be shared (booking should be made directly at Eastern Star Golf Club). Non-golfers are welcome to join the party reception at The Soul Lounge at THB 1,200 net per person, and 50% off for children below 12 years old. For golfers intending to stay over on that weekend at Hard Rock Hotel Pattaya, a special room rate of THB 3,700 net including breakfast for two persons is available. The proceeds from this event will be donated to Hard Rock Charity Fund whose beneficiaries include H.R.H Princess Maha Chakri Sirindhorn Charity Fund, Baan Nok School and Wat Sawang Arom School, Rock The Farm, Rock The Lunch and Rock The School projects. The Minister inspected a cricket bat and tried his hand at batting a few times. Chiang Mai has become an important centre for youth cricket in recent years, as shown by the two junior teams who now participate in the Chiang Mai Senior League. Chiang Mai has cricket facilities which are second to none anywhere in Thailand and the city regularly plays host to visiting teams from around the world. The first week in December saw a visit to Chiang Mai from a Hong Kong school which could be the first of many junior tours arranged as the team from Delia Memorial School came to stay at Prem School which boasts a magnificent cricket ground and excellent practice facilities as well as a good reputation for hosting visiting schools for educational and sporting reasons. 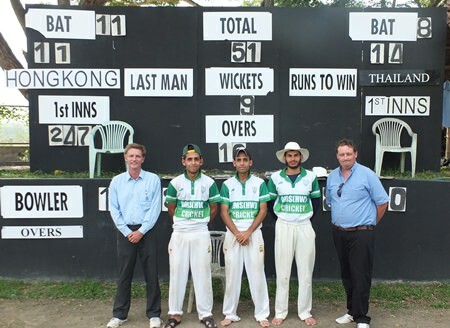 A week of cricket was arranged for the visiting team who faced four of the sides that make up the Chiang Mai Senior League. First the tourists played the two men’s sides, Chiang Mai CC and Chiang Mai Lanna, and after a day’s break they played matches against the two local junior sides, Lanna Juniors and CPP School from Doi Saket. This proved to be an ideal combination of fixtures as the adults proved too strong for the visiting youngsters but the side from Hong Kong finished the week strongly as their three best players, Akbar, Sarfraz and Waqas Khan, proved simply too good for the Chiang Mai junior teams. The Khan boys, Akbar, Sarfraz and Waqas, from Delia Memorial School in Hong Kong proved too strong for the locals. Chiang Mai CC provided the opposition in the first match but the Hong Kong side did well to reach 223 for 9 in 40 overs as Waqas Khan made 52 and his twin brother Sarfraz 105 as they shared a partnership of 122. CMCC had to work hard to reach their target thanks to 40 from Ubaid and 58 from Umar as they won a highly competitive match by two wickets. Chiang Mai Lanna provided the opposition in the second match and surprised the young Hong Kong side by reaching 169 for 6 in 30 overs thanks to Gary Chatfield’s 73 and a determined partnership of 98 with Chris Coombes, as both relied on their extensive experience of high level cricket. The boys then had to face a combination of Paul Johnson’s pace and movement and the miserly control and low bounce of Eddie Joyner. The pair shared seven wickets and the school side were soon 51 for 7 and finished on a total of 89 as Lanna gained a famous victory by 80 runs. The Hong Kong juniors looked shell shocked as they left the ground while the Lanna veterans stayed behind to celebrate their victory, but the youngsters bravely regrouped on their rest day and returned to face the Lanna Juniors side who were hoping to repeat the success of the senior side. The boys from Hong Kong batted much better on this occasion as they reached 225 for 5 in 30 overs, Akbar Khan making 65, and Sarfraz Khan 46, then Lanna Juniors were bowled out for 137 as Bunchuai hit 24, Chanchai 21 and Cher 29, Waqas and Akbar Khan each claiming three wickets. Lanna’s youngsters had given a good account of themselves but Delia Memorial School had gained their first victory of the week by 88 runs. The boys from DMS, and the three Khans in particular, saved their best performance for last as CPP were completely outclassed. The visitors this time amassed 247 for 6 in 30 overs, Akbar Khan hitting a century and Waqas Khan making 56. This display of batsmanship would have no doubt impressed the Minister of Sport who had been inspecting the excellent facilities available at Prem and gaining insight into the wonderful game of cricket. He left soon after lunch so missed seeing an incredible display of fast bowling from the twins, Sarfraz and Waqas Khan, who shared all ten wickets, claiming five victims apiece, as CPP were rolled over for 51 in just 10.2 overs. DMS won by a mighty 196 runs as a wonderful week’s cricket came to a highly dramatic end. Prem’s beautiful ground and excellent practice facilities had been used to the full and Chiang Mai cricket had shown it could provide touring teams with the perfect mixture of adult and junior opposition. This could just be the start of things to come as Chiang Mai has the facilities and organizational strengths to establish itself as a home for cricket, especially at junior level, unrivalled in South-East Asia. A charity football match between Rajamangala University of Technology Lanna (RMUTL) students and the Maldives Star Rider team which included a Channel 3 actor, was held on December 6, 2013 at the football field at Rajamangala University of Technology Lanna to raise funds to purchase goods and necessities for soldiers stationed in the Deep South this New Year. Khuntana Beawbanchong, Dean of the Faculty of Business Administration and Liberal Arts of RUMTL presided over the opening ceremony before the teams took to the field. Cheering students kept the match lively and funds were raised to purchase day to day necessities as well as items like CDs, books, and cards for gift bags that will be sent to build morale for soldiers stationed in the Deep South of Thailand. Maldives Star Rider team beat RMUTL 2-0.